Workers at the U.S. Embassy in Havana leave the building on Sept. 29, 2017, after the State Department announced that it was withdrawing all but essential personnel from the embassy because Cuba could no longer guarantee diplomats' safety. A year ago, President Donald Trump announced tougher policies concerning Cuba, reinstating travel and trade restrictions eased by the historic Obama-era opening between Washington and Havana. As a result, the United States today is largely sitting on the sidelines as the communist-ruled island faces potentially major changes in its economic and political relations with the region. 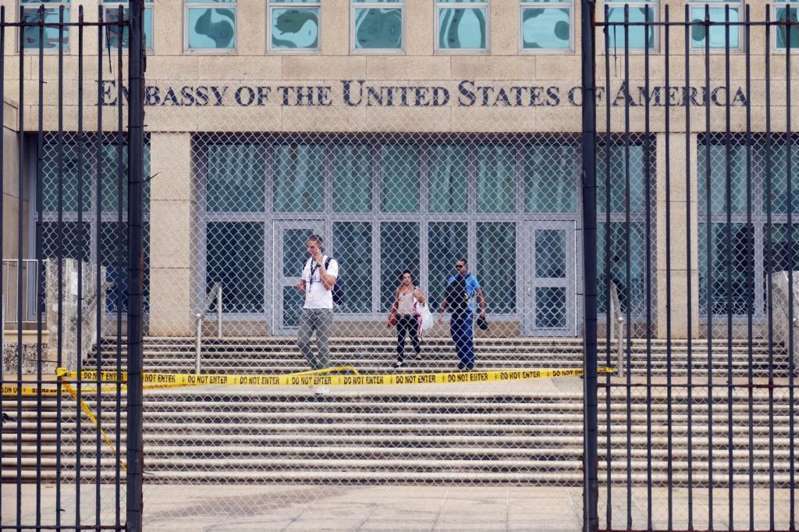 The problem is exacerbated because the recently reopened U.S. Embassy in Havana sits nearly empty. Most U.S. personnel were withdrawn last year after two dozen diplomats and other employees reported unexplained medical problems that left some with hearing loss or mild brain damage. The State Department added a 25th American to the list on Thursday. As the U.S. chill with Cuba deepens, Trump has praised one of the world's most notorious despots, North Korean leader Kim Jong Un, and promised economic opportunity if Kim's government gives up its nuclear weapons. "It is baffling we are going in the opposite direction on Cuba," said Carlos Gutierrez, who was secretary of Commerce under President George W. Bush and opposes Trump's reversal on Cuba. Trump "wants to increase prosperity in North Korea but keeps outrageous sanctions on Cuba," said Gutierrez, whose family fled the island after the 1959 revolution led by Fidel Castro. "After almost 60 years of animosity, it's time to rebuild ties." President Barack Obama sought to rebuild those ties in December 2014, when he and Cuban President Raul Castro simultaneously announced plans to restore diplomatic relations broken since 1961, shortly after Fidel Castro took over. Within months, Obama had loosened decades-old restrictions on Americans and U.S. companies traveling to and doing business with Cuba. Each country opened an embassy in the other's capital, and travel across the Florida Straits and mom-and-pop businesses in Cuba flourished. During his campaign, Trump vacillated between denouncing the Cuban "dictatorship" and vowing to make a "better deal" with Havana. Once in office, he said he was "canceling" Obama's arrangement and blasted the Cuban government's human rights abuses, which consist of persistent harassment of dissidents. The changes that Trump announced on June 16, 2017, in the heart of the Cuban exile community in Miami, were minor in scope but had a deep impact. He restricted the ability of Americans to travel to Cuba as tourists. U.S. businesses could still operate there, although the administration later barred any dealings with an estimated 180 firms or entities tied to or controlled by the Cuban military. The Cuban army is deeply entwined with the Cuban economy, especially in the tourism industry. Several hotels and a handful of restaurants belong to the military. Trump said the measures would prevent money from going to Cuba's military or intelligence services and eventually force the government to open up politically and tolerate dissent. He said the goal was to stand up to "communist oppression." But because of Trump's sweeping rhetoric in Miami, many Americans thought it was no longer possible to travel to Cuba. U.S. tourism has fallen precipitously this year, although international cruise ship visits are hitting record highs. U.S. exports of chicken and other food and agricultural products from farm states that supported Trump remained strong. Some of that commerce is governed by regulations that predate Obama's normalization of relations. Exports of U.S. food and agricultural products to Cuba are up 25 percent thus far this year compared with 2017, according to John Kavulich, president of the U.S.-Cuba Trade and Economic Council, which supports business with the island. Trump's trade restrictions largely hit small Cuban businesses, including hair salons, restaurants, car washes and bed-and-breakfasts, the kind of small-scale capitalism the White House professed to support. Less harmed was the government apparatus. The number of small businesses in Cuba grew from 157,000 in 2010 to 567,000 at the start of 2017, according to a study by the Americas Society, a business organization based in New York. Since early 2017, the number of new applicants for private business licenses has plummeted. More than a loss of economic opportunity, Washington seems to be sitting out on possible influence during a time of unprecedented political transition, according to academics and diplomats. For the first time since the revolution, Cuba is ruled by someone not named Castro. Fidel Castro, the country's legendary leader, died in November 2016. That opened the way for gradual change in the sclerotic government. His brother, Raul, took over and loosened domestic travel restrictions for Cubans and allowed the country's first dabbling in private enterprise in nearly half a century. Miguel Diaz-Canel, handpicked by Raul as his successor, is overseeing the drafting of a new constitution and is regarded as a younger-generation figure more open to technology, internet access and other trappings of modernity. But under Trump, the United States has refused to engage, reducing its interaction to a series of low-level meetings. "We had more opportunity to influence them than we ever had," said John Caulfield, a veteran U.S. diplomat who headed the American interests section in Havana from 2011 to 2014, an office that served in lieu of an embassy for decades. "We have lost that" following Trump's restrictions, Caulfield said. China and Russia, which had pulled back from the island that they once sponsored, are moving back in at full speed, financing infrastructure and other projects, raising alarms at U.S. Southern Command military headquarters outside Miami. "The fact that we are giving them (Russia and China) a free hand to extend their presence is not in the U.S. national interest," said William LeoGrande, a Cuba expert and author of "Back Channel to Cuba," which chronicled the 18 months of secret negotiations that led to the Obama opening with Havana. LeoGrande said Trump has essentially "outsourced his foreign policy" to Sen. Marco Rubio, R-Fla., a member of an influential but diminishing group of conservative Cuban-Americans staunchly opposed to engagement with Cuba. Last month, apparently at Rubio's insistence, the State Department canceled an annual seminar on Cuba that would have featured speakers who favor rapprochement. Veteran Cuba hands said the decision robbed the diplomatic corps of valuable knowledge and analysis. "There is a short but clear path from politicizing academic outreach events to politicizing intelligence itself," Daniel Erikson, one of the Obama administration's point men on Cuba, wrote at the time. "The Trump Administration now finds itself on that slippery slope with regard to Cuba." Rubio said he would always denounce any softening toward Cuba while the current governing system is in place. U.S.-Cuban ties were further eroded after two dozen American diplomats or their family members in Havana began reporting mysterious ailments in late 2016. The Trump administration is holding Cuba responsible, while Cuba has denied any involvement. As a consequence, Washington pulled most of its diplomatic staff from Havana and expelled an equal number of Cuban envoys from Washington. The State Department has said the bare-bones staff at the U.S. Embassy in Havana is not able to process visas for Cubans seeking to travel to the United States. No cause for the ailments has been found in more than a year of investigation by the FBI and other U.S. and Cuban authorities.